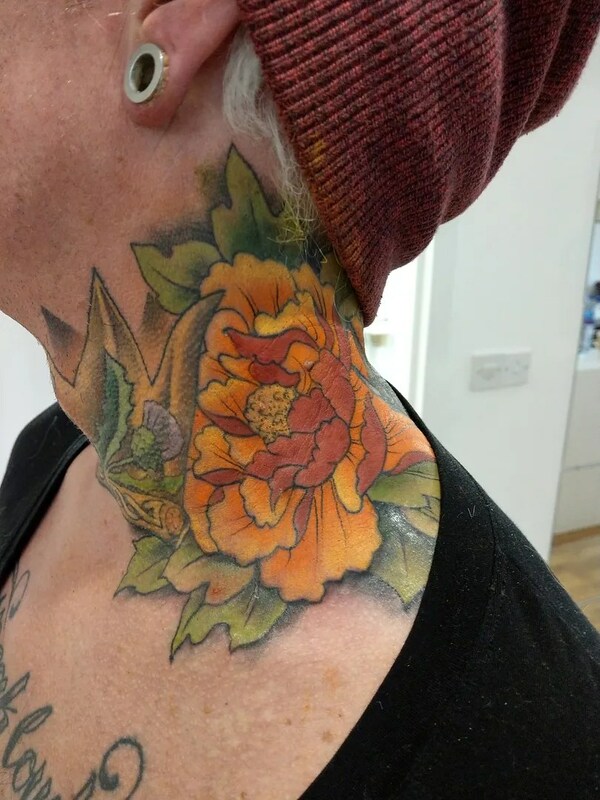 A nice bright orangy peony on neil’s neck. 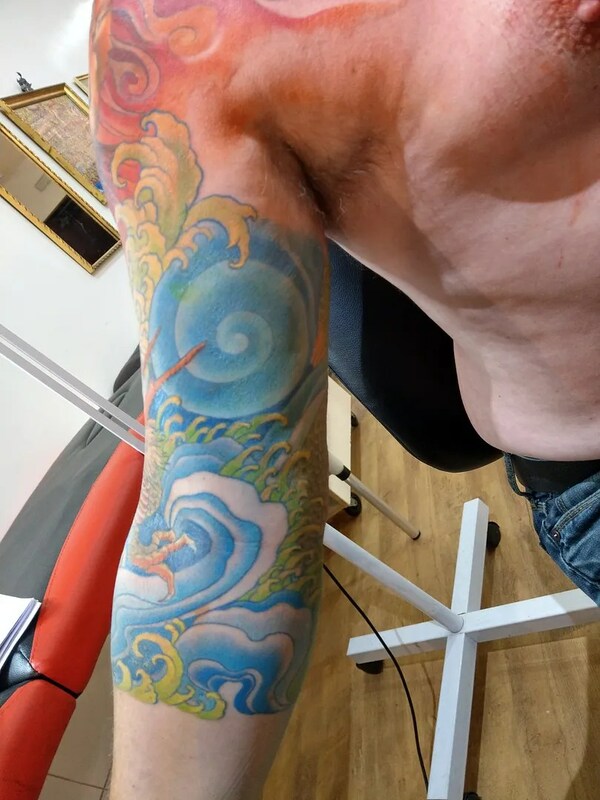 We had already done a bright crown on the front of his neck, which is very striking, however any tattoo that sits under the chin will usually be in a shadow- cast by your chin- and that doesn’t alow it to glow as much as Neil likes it. 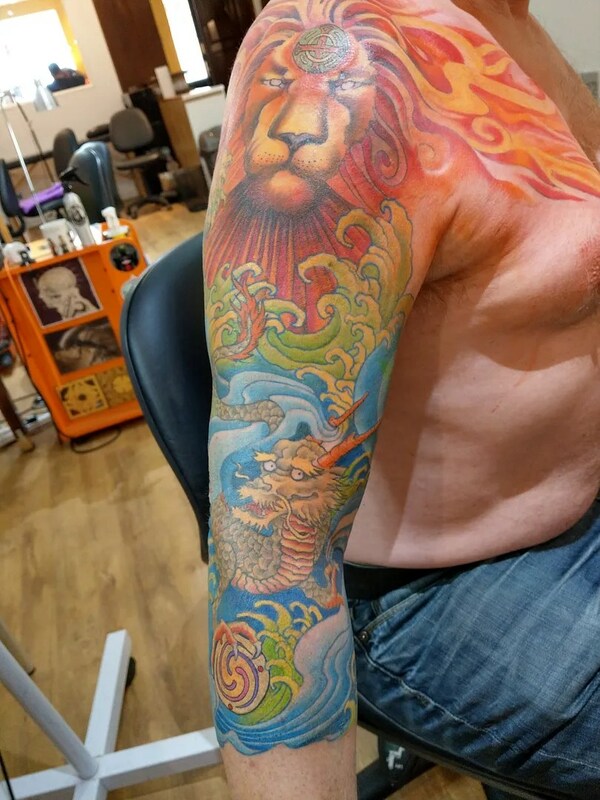 So we went for a bright one at the side of the neck, a more visible placement than the front of the neck- you wouldn’t think so, but it’s true. I’ll get some pictures of the crown next time to show you. 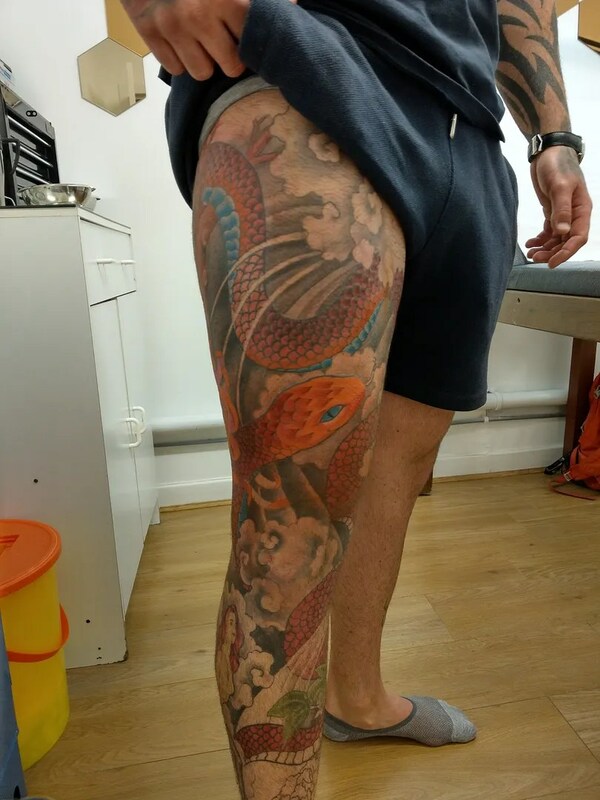 we are still working on Luc’s leg snake, some more colour here and there, it’s starting to come together. 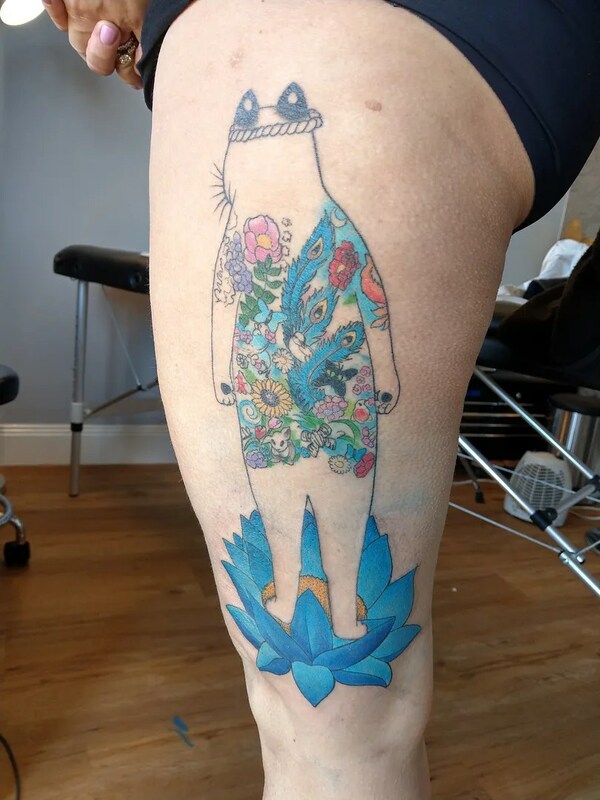 With a project this size it seems like ages until you start to feel like you are getting somewhere, but this is shaping up. 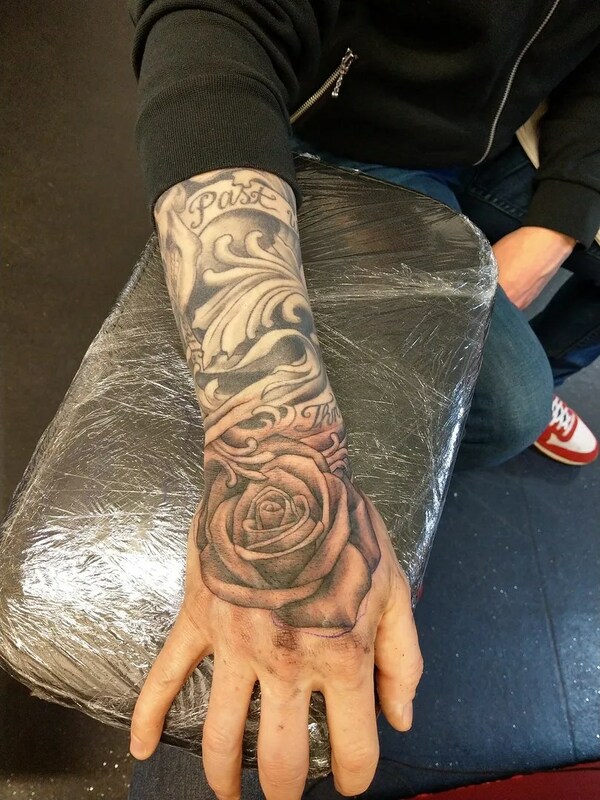 Matthew got a black and grey sleeve by me a wee while ago, and was feeling that it needed to come down onto his hand. 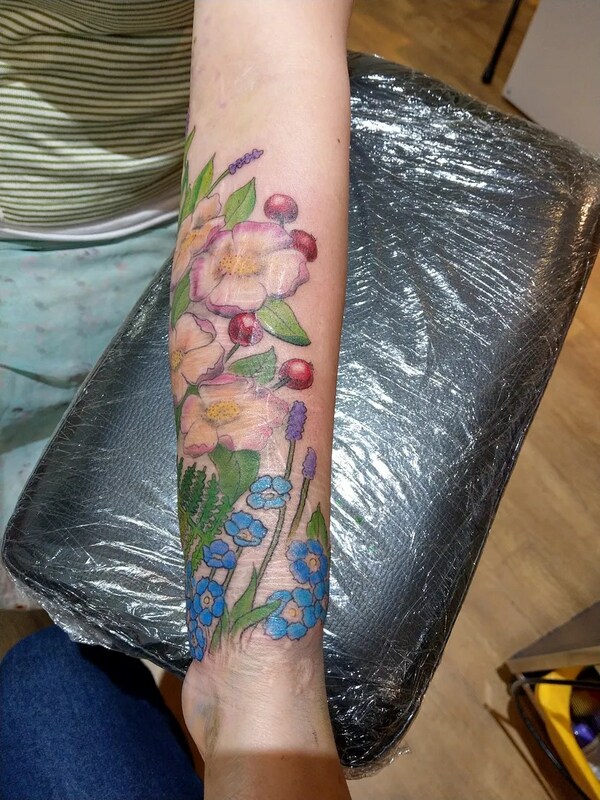 The stigma of having tattooed hands is much less these days, so why the hell not . Kiaran got this cute little bird, I wish I could remember the name of it, but it’s just adorable. 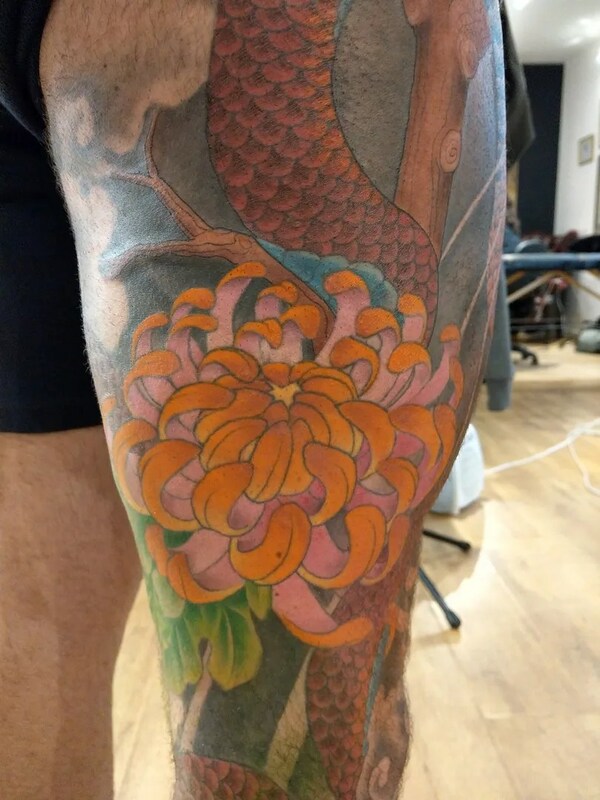 we added some red outline blossoms to help it work with some existing pieces by another artist, and it sits in there just so. 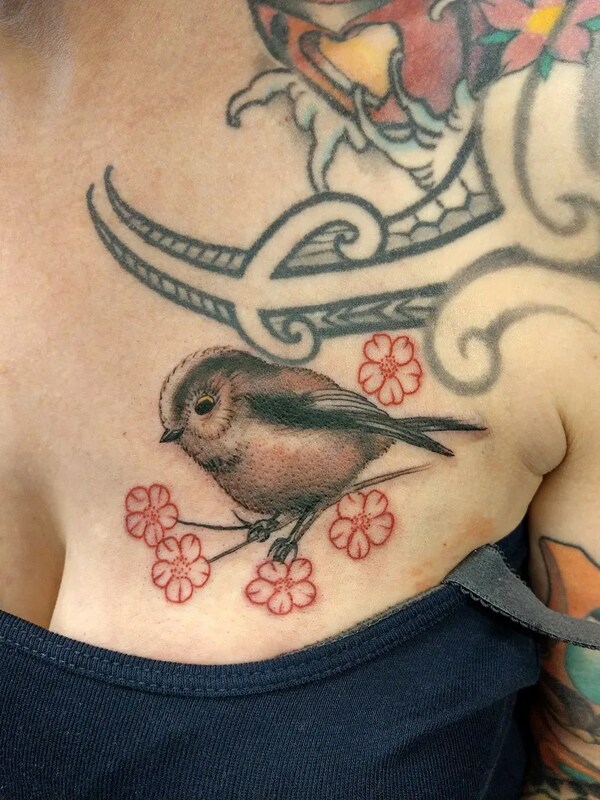 Kiaran is a very talented lady, and is currently in the process of designing us a new website for the studios. We are super excited, should be up soon, woo! 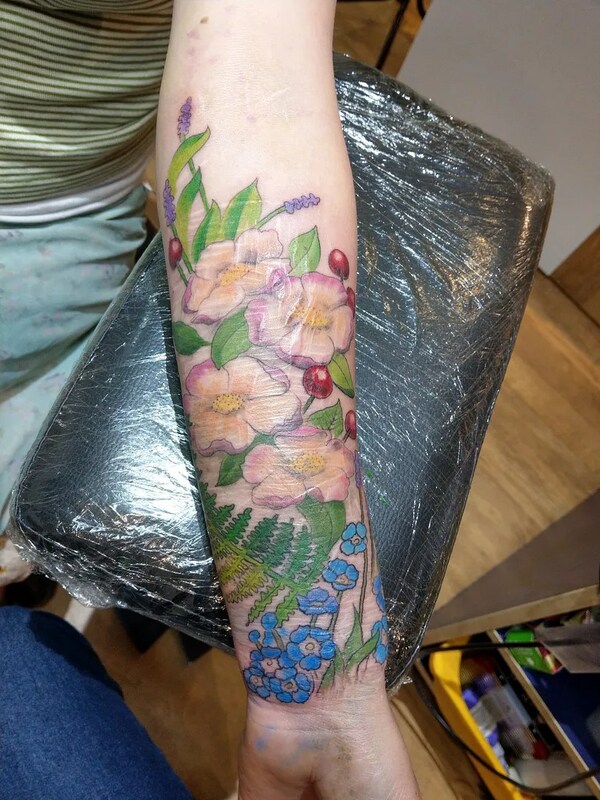 Another work in Progress is a colourful scar cover up. 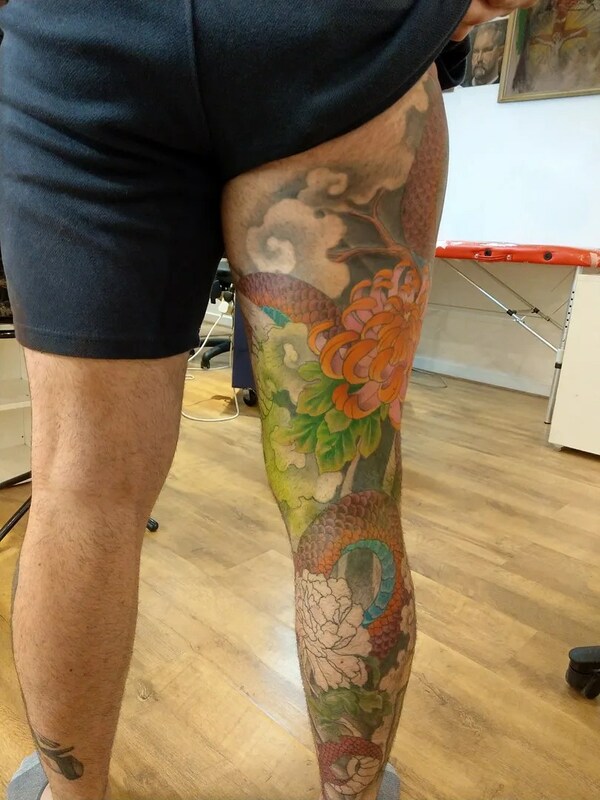 With scars you are well advised to let the new tattoo settle and see how the skin takes the ink, then come back to it to add more colour and detail, etc. Sometimes the scars are hard and can reject the ink, sometimes the opposite, so we will let it heal and see where we are with it. Good start was made, though. 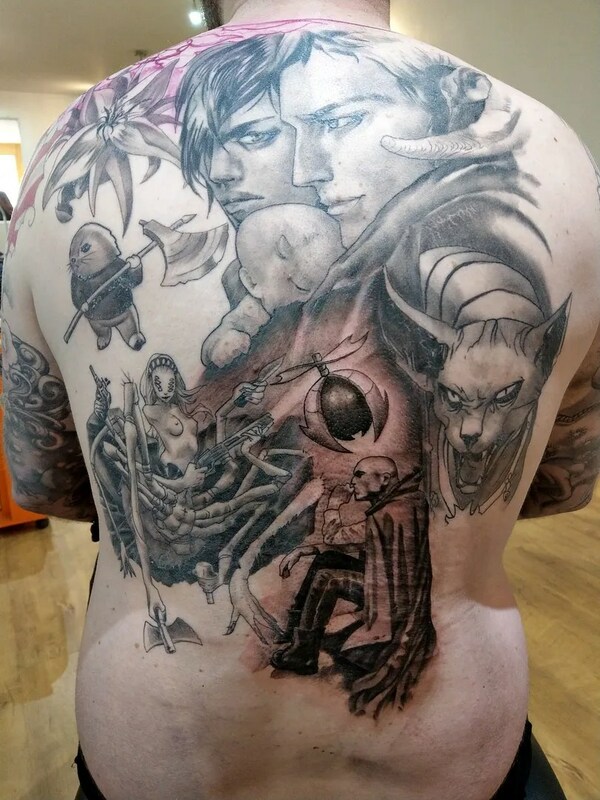 saga fans will like this, and there appear to be many out there!